Relax on firm support without pressure. Durable orthopedic seat cushion evenly distributes weight and encourages good posture, for maximum comfort and spine support even when sitting for long periods. 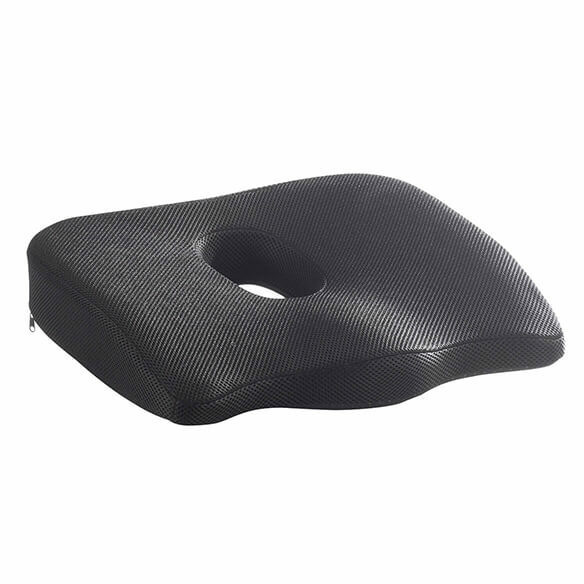 Center cutout reduces pressure on the coccyx, perfect for anyone prone to lower back pain, numbness or pressure sores. Ideal for home, travel and wheelchair use. Zip polyester mesh cover with non-slip bottom allows for cooling air flow. Polyurethane foam coccyx pillow keeps it shape. Chair pad measures 16 1/2"W x 14 1/2"D x 3"H.
Machine wash cover in cold water, gentle cycle; tumble dry low. Do not bleach or dry clean. Hopefully helps my husband's spine when sitting. To have better support and comfort when sitting in my office chair to use my computer. I bought the cushion because of it's shape and the ability to sit longer especially with back issues. Support is extremely important to me after two back surgeries. I wanted a cushion that would not collapse for my office chair. This cushion has a dense foam. My computer chair cushion has flattened and I need a bit more fluff. Am trying all different kinds for longest sitting time comfortably. Need to add height to chairs for ease in getting up. This had good reviews so I chose it. I have a back problem and need to sit comfortably. My spouse recently had spine surgery and I think this item will be helpful for him. Hoping to stop pain from hard and uncomfortably shaped seats. Hoping to get some relief from sciatica pain. My tailbone was removed in a surgery many years ago. 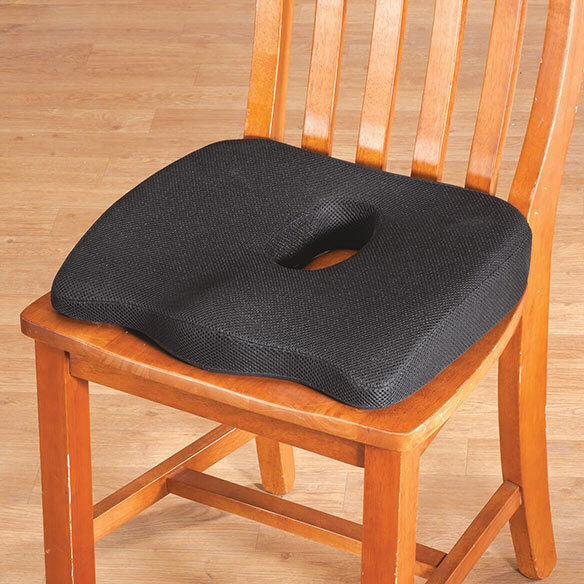 I use some donut cushions, but I thought this may be more helpful. does it have a handle to carry? BEST ANSWER: No, it has no handle to carry. I am pleased with it. It seems to be quite strong, and will be much better than the doughnut cushion I have been using. When I want to take a cushion with me I have a canvas bag chosen for size that I slip the cushion into, and sling it on my shoulder. Hope it helps. Thank you for your question. It does not have a handle. We hope this information will be of help to you. How much weight will the pillow hold? BEST ANSWER: Thank you for your question. The cushion has a weight limit of 330 lbs. We hope this information will be of help to you.